The Miller Ferry Boat Service provides passenger and vehicle transportation across Lake Erie to South Bass Island and Middle Bass Island. Mainland port is located in Port Clinton, Ohio at the end of Catawba Point. A leisurely 18 minute ride is all it takes to traverse to Put-In-Bay. Moreover, passengers can opt to sit on the open air deck, or take refuge in the small shelter house. Also, guests can opt to bring their vehicles and trailer on the Miller Ferry. Cars are loaded by simply driving onto the vessel. The Miller Ferry is responsible for bringing much of the supplies to the island. Imagine, each and every item that is on the island had to arrive by boat or air. So, this keeps the Miller staff busy. Furthermore, daily items such as bread, milk, eggs and newspapers arrive across Lake Erie. However, in approximately January or February the Miller Ferry shuts down until around April. This is due to the icing conditions of Lake Erie. Prior to the Lake being entombed in ice, the crew docks the boats at the downtown Put-In-Bay location. The hard-working crew then receives a well deserved break. The Boat Line has been servicing the Lake Erie Islands since 1905. Throughout the years, they have earned a reputation of being a reliable and safe service. Each season thousands of passengers make their way to Put-In-Bay and Middle Bass Island under their care. With a low cost fare, you and yours can get to experience the island life. A mood that watches worries flee, and the good times aplenty. Put-In-Bay awaits your arrival. Once on the island, Miller Ferry passengers are presented with a few options. First, they can opt for a golf cart rental. Three are located within walking distance to the dock. Second, they can take the bus downtown. However, the most entertaining option is via taxi. For just $3 per person guests can be whisked away to their choice destination. Moreover, taxi drivers are known to help guests find golf carts when they are sold out elsewhere. For more taxi information, peruse this page for more details. 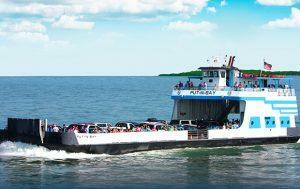 Take the Miller Ferry for an Island Stay! Staying on Put-In-Bay is the best way to see it all. With a plethora of awesome attractions, really good restaurants and super shopping, the choice is easy. So, to choose the best Put-In-Bay Hotel, Resort or Home for your stay, be sure to look over our Put-In-Bay Lodging Partners. We look forward to seeing you on the island. Cheers!